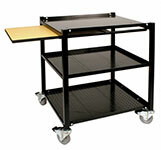 Description A smart 'art cart' on wheels, this sturdy cart has a solid top shelf and two steel mesh shelves for storing your ceramic supplies while working. In addition, it has a retractable shelf that can be pulled out on the right or left side for additional work or storage area. The top shelf also has four pre-drilled holes to accommodate the brent® Mini Slab Roller (see image above). The four heavy-duty swivel/locking casters make the SmartCart easily maneuverable and can be stored away in closets. Assembled dimensions: 27"W x 24.5"D x 34"H.